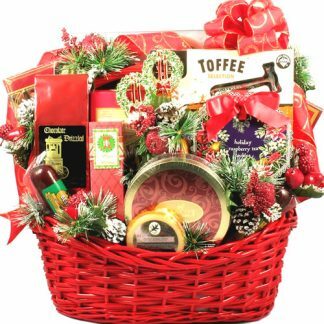 When it comes to Christmas gift baskets, this one takes the cake. 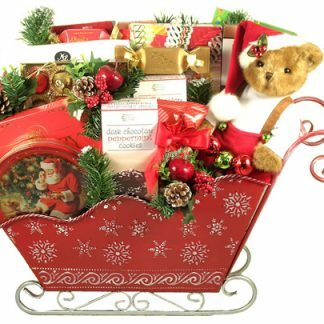 Standing two feet tall and over two feet wide, this GORGEOUS gift will take their breath away! 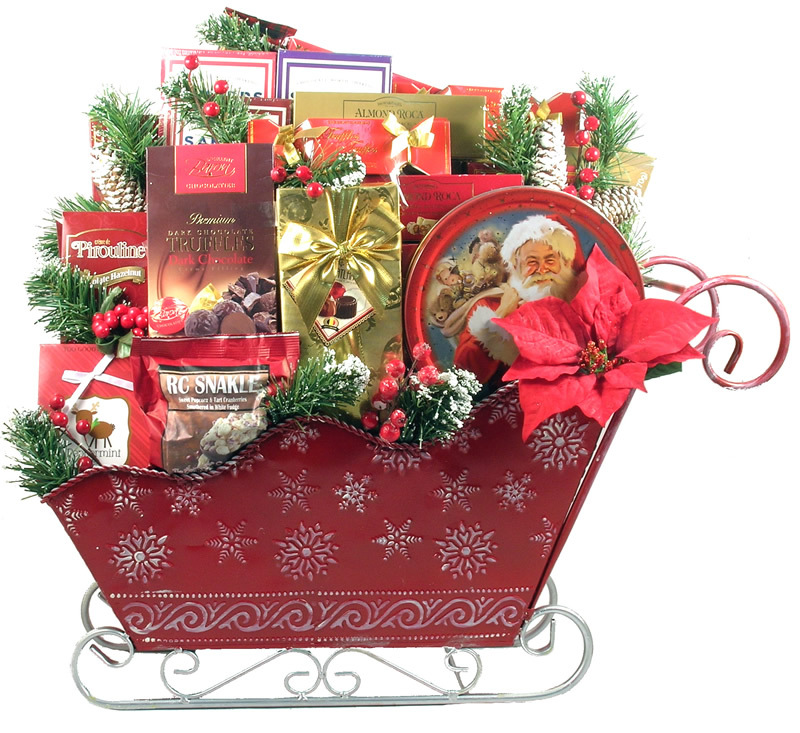 They will be delighted as they discover all of the amazing treats tucked inside.Assortment of Decadent Chocolate TrufflesMilk Chocolate Coconut ClustersCollector’s Holiday Tin Filled with Assorted Danish Butter CookiesA Holiday Canister of Virginia Peanuts and Chocolate Covered Cranberry Nut MixMilk Chocolate Covered CherriesCookies and Cream BarkChocolate Peppermint Filled Wafer CookiesAssorted Chocolate CookiesHoliday Spice CookiesVanilla Cream Filled Wafer CookiesChocolate Truffle CookiesTriple Chocolate Hot Fudge BrownieAssorted Fruit Flavored Hard CandyAlmond Roca (Buttercrunch Toffee with Chocolate and Almonds)Assorted Belgian ChocolatesCranberry Bog FrogsCreamy Peppermint FudgeCreamy Chocolate Fudge”Smooth N’ Melty” Petite MintsYogurt Frosted PretzelsCaramel and Cheddar Gourmet Popcorn MixHoliday Gift Box of TeaChocolate Caramel Peanut ClustersFestive Sleigh Bell Ornament All of this arrives artfully arranged in a hand-painted, metal embossed, old-fashioned, keepsake sleigh, which is decorated with festive holiday picks and a designer bow! 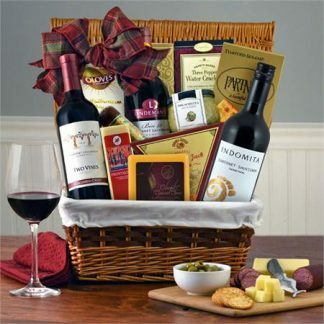 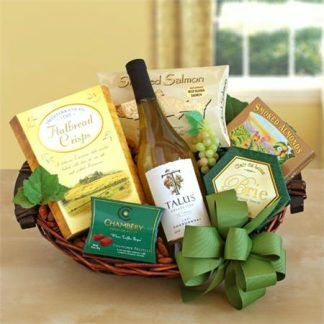 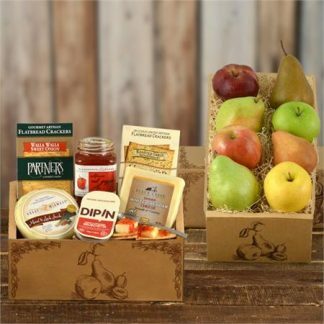 Just imagine their excitement when this gift basket comes dashing through the snow right to their front doorstep! 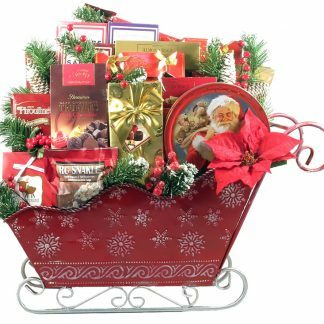 This impressive gift basket is an absolutely stunning way to help create a Christmas to Remember!